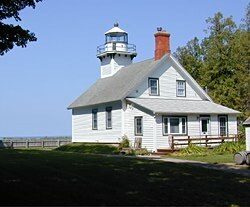 Mission Point Lighthouse has been a Traverse City and Old Mission Peninsula icon for decades. Located at the end of a picturesque drive along M-37 through cherry orchards and vineyards, Mission Point Lighthouse stands as a classic piece of Michigan history. While it no longer guides mariners through West Grand Traverse Bay as it did from September 10, 1870 until it was decommissioned in 1933, Mission Point Lighthouse now offers visitors a peek into what life was like around the turn of the century for lighthouse keepers and for others who lived and worked at that time. Lighthouse Park guests are invited to enjoy self-guided historical tours through the Lighthouse (climb all the way up to the tower! ), to visit our quaint gift shop, to peek into the historic Hessler Log Cabin, to explore the miles of unspoiled trails that run through and around the park (many of which are just as historic as the Lighthouse itself), to picnic, to photograph, to watch for birds and other wildlife, to stroll the beach, to gaze out at the sunset, and to simply relax. We have a Fresnel Lens on display in the museum as of 2011 and operate a very popular keeper program, in which people can live in the lighthouse and be a keeper. The cost is $150 per week. Weddings are also becoming very popular at the Lighthouse.